Spring, Summer, and Autumn are crop seasons when plenty of varied fruit is available. Sometimes it is too much. 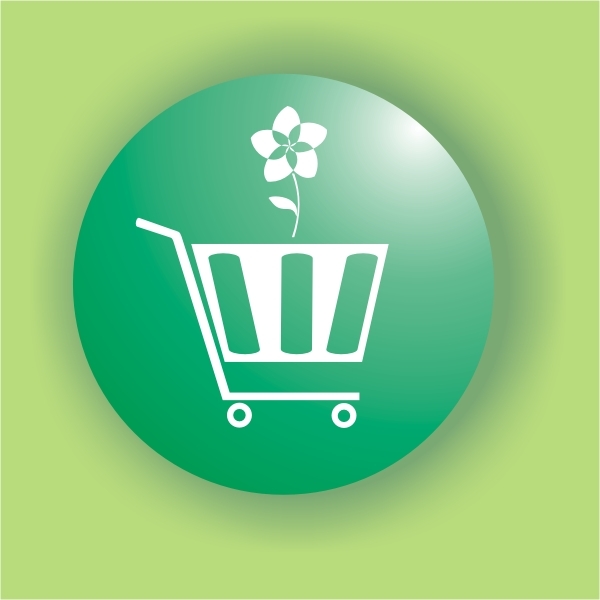 That excess can be stored for winter and times when the supply is lower than demand. Dehydrating is the most natural and simple way to preserve fruits, vegetables, mushrooms and herbs. The nutritional value, taste, and health benefits of the foods are all kept or improved by dehydration. Dehydrating is a good alternative to canning and freezing, which spend much more energy and often use additives. Through dehydration, fresh produce can easily be handled during crop season and kept for weeks, months or even years without requiring special care. 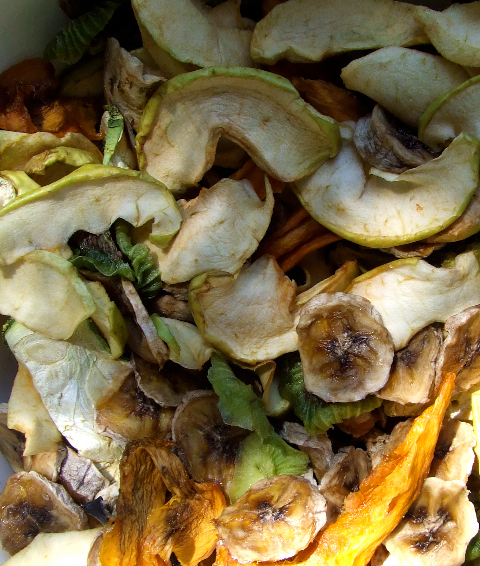 Dehydrating prevents food waste when there is a surplus and allows us to enjoy natural foods out of crop season. For example, we can enjoy dehydrated strawberries in Winter or dried mushrooms in Spring. Dehydrated foods can be stored for many months at room temperature and do not depend on electricity or other power sources to keep their quality. Unlike canned or frozen foods, dried produce need little storage room and are naturally processed into nutritionally rich and more natural foods. For a good and long preservation of the dehydrated foods their moisture content should be checked before storage. Food should be completely cooled before packaging, because condensation in the package causes mold. The packages must be dry. Glass jars with metal screw lids are the best. The foods should be stored in a cool dry place and as dark as possible. The ideal temperature is 5 to 20ºC. You can then eat the dried fruits either plain or as delicious snacks. They are easy to carry to work or school or they can be added to soups, gravies, baby food, breakfast cereals, smoothies, and other recipes. If you like you can soak them for a few minutes before use. The most natural way to dehydrate foods is to expose them to the sun. That is not always possible, so the alternative is the electric dehydrator which allows you to dry foods at home at any time of the year. Using a controlled temperature, the air is distributed to each of the trays and it removes excess moisture. Regulating the temperature (from 35 to 70ºC) allows a delicate treatment of the foods and an active circulation of the hot air which will assure proper dehydration. This way the precious nutritional values are preserved and only excess water is removed. Depending on the moisture of the food and the surrounding environment, the drying time can vary. It varies according to the selected temperature, type of food, and texture. Normally 8 to 14 hours are enough to dry foods such as sliced apples or strawberries. 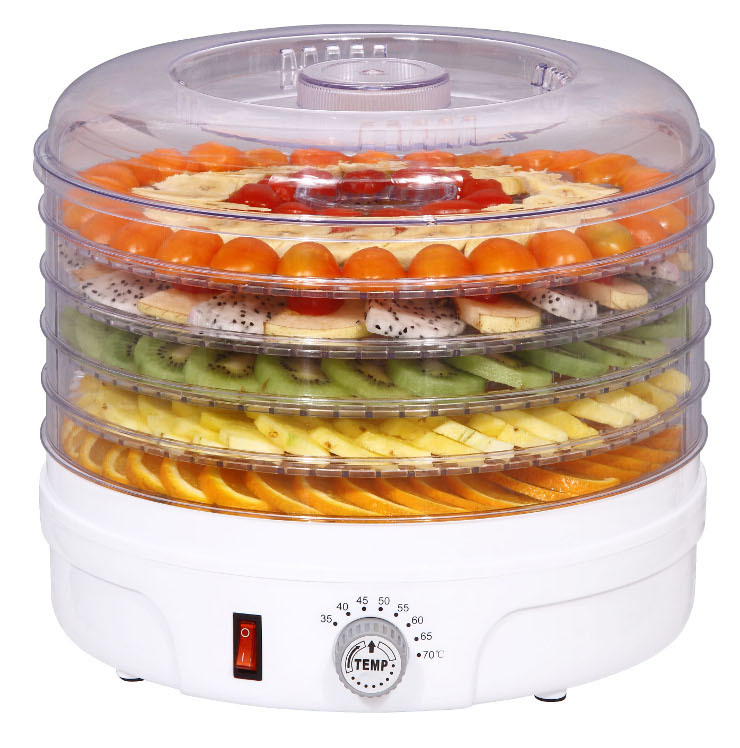 Fruits and vegetables dried in a dehydrator can look different from those sold in stores and supermarkets. That is because neither artificial preservatives nor dyes are used. For example, to better preserve colour in apples, you can sprinkle a few lemon drops over it, which prevents natural oxidation. Besides fruits and vegetables you can also dehydrate mushrooms, herbs (to season or infuse), flowers (for room scent), bread (croutons) and even dough for pizzas or cookies. 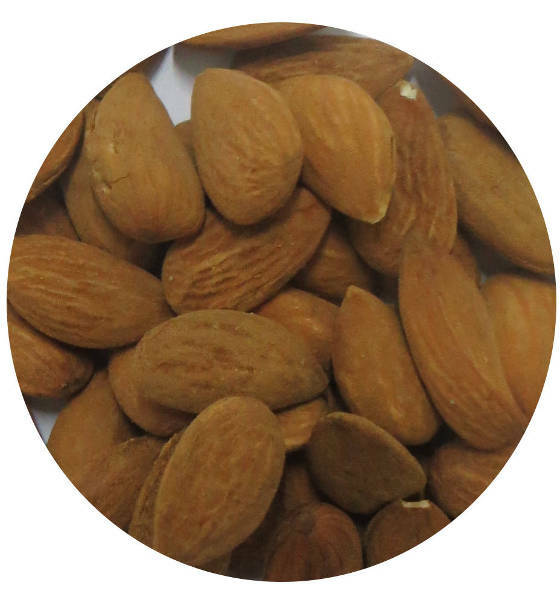 A selection of almonds from organic farming. Suitable to dehydrate raw food recipes or moist foods.